"A gift from me, to me." BIENVENUE! 👋 If you've found yourself in this post, then I'm sure you've already heard the fantastic news — Torrid is having a 30% off sale! 1. A ribbed drape front cardigan you can slip on over any ensemble for a cozy layer of warmth. Bring it on, office AC. 2. Mid-rise skinny jeans I genuinely feel bad for, because these basic babies will never get a break. You'll want to wear them every darn day. 3. An exceptionally soft tunic tee you'll want to stock up on. This will quickly become your work shirt, your date night shirt, your errands shirt, your sleeping shirt... the list, like Journey, goes on and on. 4. A t-shirt bra designed with a ballet back and wider band, meaning it'll look smooth (Dare I say, invisible?) underneath your tee. 5. A knit surplice dress that no wardrobe should have to live without — because your closet is absolutely incomplete if it doesn't house the perfect LBD. 6. An iridescent sequin bomber jacket perfect for any and all upcoming NYE shindigs. Ready to ring in 2019 looking extremely fabulous? I think YES. 7. A knotted shift dress you'll want to wear to that fancy schmancy "Time to break out the uncomfortable heels!" event you have coming up. 8. High-waisted skinny jeans made from a stretchy, comfy material that will give your most-loved leggings a run for their trillions. 9. 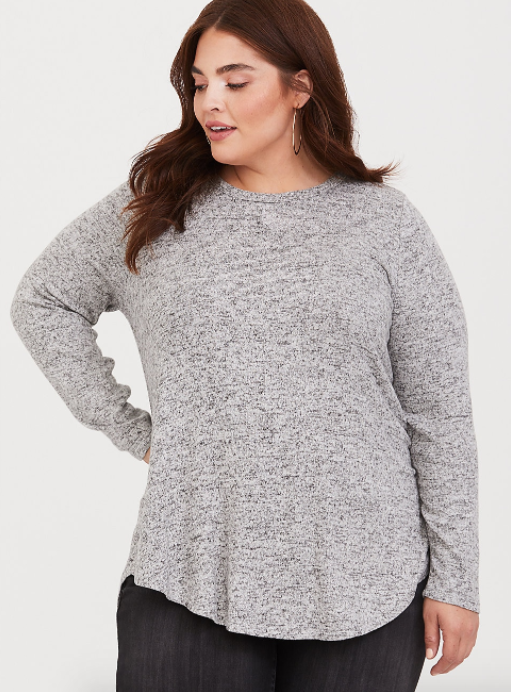 A lattice-back pullover perfect for both running errands (the worst) and lazily lounging around the house whilst bingeing the newest Netflix hit (the best). 10. A stretch peplum blazer that will make those ripped jeans and wrinkled band tee look 90000x more professional and put together. 11. Faux leather over-the-knee boots capable of matching pretty much any bottom you can think of. Jeans? Check. Leggings? Check. Skirts? Check check check. 12. High-waisted knit leggings complete with a lattice inset design that adds a fun, unique twist to an otherwise basic piece of clothing. 13. A pointelle knit tunic sweater you'll basically want to live in all winter. Move over, bears, because there's a new hibernation professional in town! 14. A racerback sports bra made from a moisture-wicking material so that you can feel *almost* sweat-free during your next workout. 15. A berry-colored sweater dress that will have you humming "Can't help falling in love with you...." every time you put this on. I guess you can say you'll love it ~berry~ much. Want to see some more beauty? Check out the rest of the Torrid sale! Me, seeing my favorite four-letter word — SALE.